The cops and robbers game from troubled Scottish developer Realtime Worlds might set the record for the shortest-lived MMO, as All Points Bulletin shuts down after a mere two and a half months in operation. 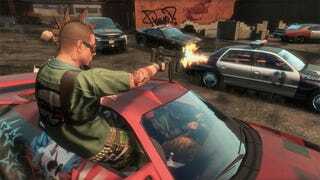 APB officially launched in North America on June 29, welcoming Enforcers and Criminals alike to the dangerous streets of the fictional city of San Paro. With one of the deepest character creation systems I've seen in any massively multiplayer game, I was sure this online Grand Theft Auto was destined for great things. This was not the great thing I had in mind. Community Officer Ben Bateman posted a final goodbye to players today on the game's official website. APB has been a fantastic journey, but unfortunately that journey has come to a premature end. Today we are sad to announce that despite everyone's best efforts to keep the service running; APB is coming to a close. It's been a pleasure working on APB and with all its players. Together we were building an absolutely amazing game, and for that, we thank you. You guys are awesome! The farewell is followed by messages from the development team, expressing their disappointment over the closing and praising the game for the ambitious project it was. I can't say this wasn't expected. Developer Realtime Worlds faced massive layoffs last month before going into administration, sort of the UK equivalent of Chapter 11 bankruptcy reorganization. We extend our condolences to the loyal players and programmers of APB. It truly is the end of a painfully short era. The servers are still up, so be sure to drop by and party like the world is ending, because it is.